Hello and Happy Tuesday! I waited until the last minute to make my SIP card this week which turned out to be a good thing... Why?? Because I received my Hero Arts My Monthly Hero Kit when I arrived home from work on Monday. How cool was that? It was perfect to make a clean and simple fall card. The color layering pumpkins and sunflowers in the September kit are gorgeous! I love clean and simple although it's not usually my style. It was sure fun to try to make one and believe it or not, I actually made a one layer card.. Wow! Can you believe it?? 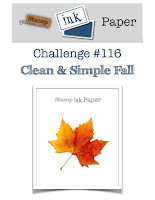 It you have an awesome idea for a Fall theme CAS card head on over to Stamp, Ink, Paper and link it up! Here's my card using the largest pumpkin from the My Monthly Hero Kit..